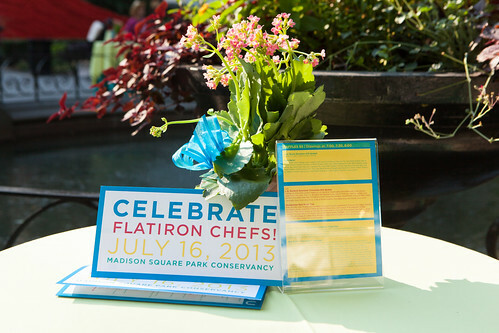 The 9th annual outdoor culinary extravaganza, Celebrate Flatiron Chefs! 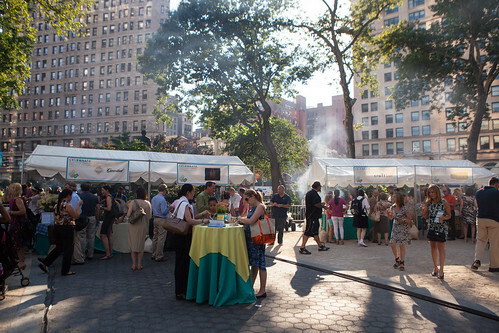 featured star chefs and restaurants, returns to historic Madison Square Park on Tuesday, July 16th. Altogether 30 fantastic chefs and restaurants, including favorites Eleven Madison Park, Gramercy Tavern, craftbar, ilili Restaurant, and Resto, will bring their culinary acumen, contributing to the biggest and best Celebrate Flatiron Chefs! event yet. This event was hosted by the Madison Square Park Conservancy. Funds raised support Madison Square Park’s horticulture, maintenance and free cultural programs, including Madison Square Art, Madison Square Music, and Madison Square Kids. 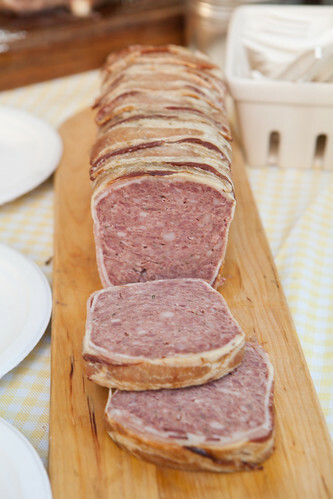 Country pâté and Caja China Pig pita “taco” by Resto and The Cannibal were delicious. 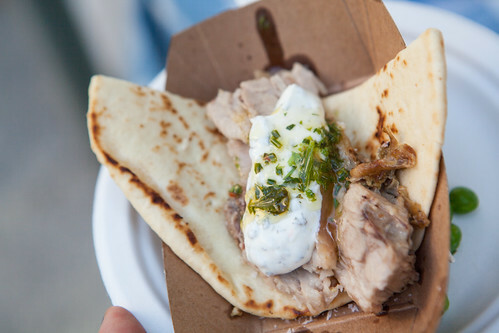 Both dishes demonstrate how delicious and versatile pork is with the earthy pâté highlighted with a piquant tarragon mustard and the juicy slices of Caja China roasted pig worked wonderfully with the Greek sauces of tzatziki and salsa verde on a fluffy pita. Manzanilla‘s steamed brioche bun, pulled oxtail, mushroom and kale sandwich looked intriguing from a distance as I was walking station to station mainly because of it’s shape like a bialy filled with a spicy aioli in the center. 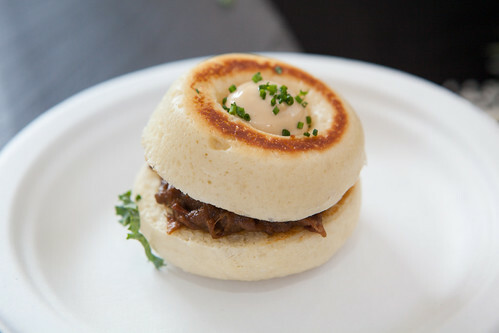 The bun is fluffy soft and the oxtail meat does work with the aioli on top. 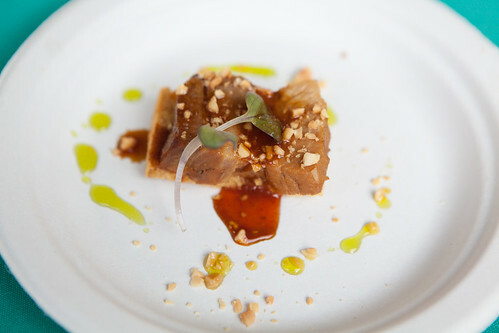 One of Maysville‘s offering that I liked the most was the compressed watermelon with country ham. 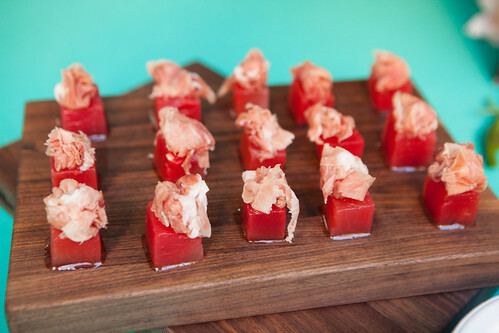 Think of the traditional Italian or Spanish appetizer of melon and ham but you’d have the sweeter, juicier watermelon in place and the ham gave it a hint of salt. One of the prettiest and delicious cupcakes I’ve eaten in the longest time was Maialino‘s olive oil cupcakes with mascarpone and fresh blackerry. Oh, it was simply phenomenal that I ate three of them! 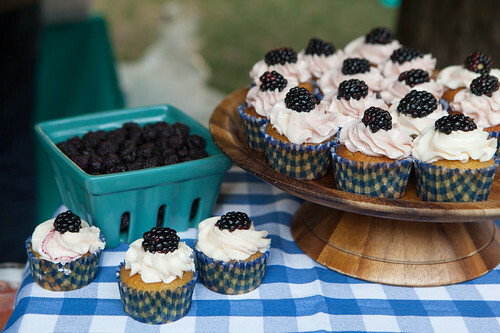 The olive oil cupcakes were very moist and intense with fruity olive oil flavor and the very softened mascarpone frosting (it was 90+ degrees) was sublime with the cake and sweet-tart blackberry on top. 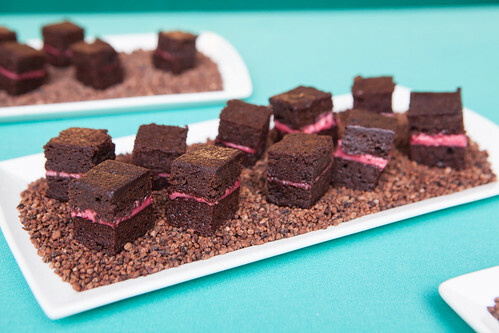 Gramercy Tavern‘s raspberry brownies were delicious bites of soft, cakey brownies sandwiched in a lovely raspberry buttercream topped with cacao nibs. Perfectly balanced between sweet, tart and bitter and there’s a nuance of nostalgia.